Truth lies in the eye of the beholder or more accurately, in the pen of the writer. It is perceived and nurtured by the minds of humans and can be construed or not by those same people. I want my students to be able to read a text critically and articulate clearly what they have read. I also want them to examine what they read and make judgments about that reading. Finally, I want my students to discover that writing is a crucial tool for the discovery, creating, recreating, and imagining of themselves and their community. Therefore, they can become the writers of the text and not just readers. I am challenging my 10-year-old students to question everything and to take little for granted. I want to empower them to become researchers and thinkers, questioners and doers. I am suggesting that upper elementary students can read and analyze information using primary and secondary sources: texts, which are not generally written for 10-year-olds, let alone pre-pubescent emergent readers.� Not only can they analyze primary sources; they can also create them for future generations. I am convinced that if I provide modeling, coaching, and scaffolding, these students will be able to examine and apply a strategy for critically reading a passage from a primary or secondary source and extend that understanding to a performance or an art piece that is based on student- or teacher-written scenarios from the text. I am further convinced that students can write their own texts, their own stories based on personal artifacts, and their own life stories. Begin the series of lessons with the children�s game of� �pass the message.� (One person is whispered a message and that person passes the message on.) The message travels around the room, one child at a time whispering mouth to ear until it has come full circle. The last person to receive the message says it aloud. Discuss the outcome. Introduce the career field of archivist. Invite an archivist to visit the class and discuss their work as well as one topic from their archive. (Invite the archivist from a local college to visit the class and share the history of the college with the students.) Query the students� understanding of how the speaker may have used primary and secondary sources to document the history shared. 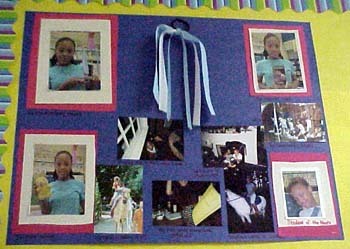 Have the students share their montages and autobiographies with the guest. Fifth-grade students love to talk about themselves. They love to share their accomplishments and adventures. My students were forever bringing in photographs and other artifacts from home and sharing them at the most inopportune times. Together, the students and I developed, over time, this project called a �Me Montage� to help other students understand primary sources and to find a more appropriate forum for all those pictures and things they wanted to share with their peers at school. Students brought in their prized possessions (report cards, science fair ribbons, trophies, photos, certificates, Beta Club programs), mounted or arranged them in aesthetically pleasing ways, and wrote short autobiographical sketches to accompany the montage. This series of activities transformed our unit on enslavement and Reconstruction from one of passive listening to active engagement. The students were forced to think more deeply about their work and the readings they had been engaged in. They were encouraged to do something with the texts placed before them. They had to prove or disprove certain assertions made from the texts. The students became so involved in these activities that they are beginning to transfer this new way of looking at texts to other areas. In science, for example, the students are asking more questions and much prefer the discovery method of learning as opposed to the read-and-answer-questions method. The �Me Montage� evolved from a simple language arts class activity into an in-depth social science activity and made learning about history and primary sources personal. One of the key questions that guides the research of KCAC is also central to this student project: What can we learn about a culture, a society, or even a person by examining what they choose to keep?� By looking through souvenirs, mementos, family albums in attics, and other keepsakes, students are encouraged to critically examine their own lives as a rich resource for recovering history.� Students learn that what we keep becomes the history we leave behind for others to discover. As a result, our choices of what to keep and what to discard become much more important when viewed as the preservation (or desecration) of history. 1. Personal history is important. 2. Personal history is inextricably linked to all history. 3. Personal artifacts often reveal as much about a time period and a culture as they do about the individual who kept them. 1. Students are instructed to collect five artifacts representing various stages of their lives (e.g., early childhood, adolescence, young adulthood, etc. ).� They are provided with a handout that further explains the process.� They are also allowed to predict and create one artifact from their futures.� Each artifact should have both personal and historical significance. 2. After collecting their artifacts, students write two- to four-sentence captions for each.� Captions should both identify the personal significance of the item and place the item in an historical context. 3. After collecting artifacts and creating captions, students create a display or exhibit for their artifacts, similar to what might appear in a museum.� Exhibits include placards containing the captions. 4. Exhibits are then presented to the whole class. The following student-generated captions accompanied artifacts students brought to present in class. Caption:� The lapa is a traditional African skirt worn while dancing.� To wear it properly, the wearer must stand with their feet shoulder width apart.� This is so the dancer can do the many leg lifts required of the dancing.� Next, they must wrap the cloth around the waist so that the strings can tie in the back.� Last, a simple double knot will hold the lapa in place.� Stephanie took African dancing when she was thirteen years old at a summer dance program at Spelman College.� She learned many West African dances and chants of celebration.� She also took dance lessons in jazz, ballet and lyrical. Caption:� Due to the large size of the Georgia map, the original map is now filed in our archives.� Instead, our science team has carefully printed out a similar map for viewing purposes.� The map symbolizes the move from Florida to Georgia made by Michael Morello.� Moving from a different state is difficult on young boys, but it is a frequent occurrence.� The population in Atlanta during the 1990s skyrocketed because of job opportunities and a nice place to live, which greatly influenced Michael�s parents as well. The inclusion of video games and CD�s, however, speaks to the increasing presence of technology in our daily lives and its power to shape interests and perceptions.� Boys, in particular, were much more likely to include game cartridges as important artifacts from their childhood, which raises interesting questions about whether the acculturation by gender in our society has really changed all that much. I feel that most students accomplished my first objective, the recognition of personal history as important and meaningful, in the initial recovery process of the project. Only a few students, however, seemed to make the leap from personal to historical relevance that I was hoping for during their creation of their individual exhibits. I discovered that the lightbulb moment came after the presentation of all of the exhibits when we discussed as a whole class the implications of the artifacts presented.�� Students began to make connections as certain items appeared again and again, and the recognition of those connections led to in-depth discussion of the cultural significance of many of the artifacts that were kept.� The class discussion enabled students to recognize that their personal keepsakes were, in fact, loaded with social and historical significance. In future applications of this lesson, I would include a few examples of artifacts and captions from previous students, and perhaps initiate a preliminary discussion of how one might draw historical significance from a personal keepsake before students embark on the project individually. I feel, however, that much of the success of the lesson stems from students discovering these ideas for themselves.